As you can see in the photos, crews are continuing work on the project that, when complete, will add one travel lane in each direction to the Loop 101 between Shea Boulevard and McKellips Road. 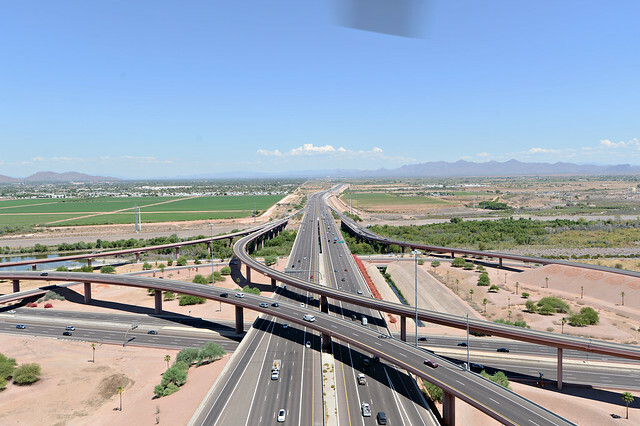 The project also includes traffic-interchange improvements, new rubberized asphalt and the addition of two travel lanes from the northbound Loop 101/Loop 202 interchange entrance ramp to McDowell. 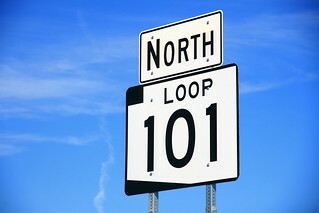 Find a collection of Loop 101 project photos on ADOT's Flickr page. Crews will start placing rubberized asphalt pavement on sections of the project beginning this weekend (Oct. 23-Oct. 26). Drivers can expect a closure of northbound Loop 101 between Rio Salado Parkway near the Loop 202 (Red Mountain Freeway) and McDowell Road from 9 p.m. Friday to 5 a.m. Monday. Both Loop 202 ramps to northbound Loop 101 will be closed. Because rubberized asphalt is temperature-sensitive and cannot be placed during very cold or very hot weather, right now is a good time to apply it in many parts of the state. If you’re interested in learning more, check out these previous posts on rubberized asphalt. For more on the project and to get the latest traffic alerts and information on upcoming closures, please check the project page. For a look at all our Loop 101 blog updates, including this recent one urging drivers to slow down in the work zone, please revisit these previous project posts.